WASHINGTON (CNN) -- You've no doubt heard the language by now -- that Americans are plagued by an oil addiction. More oil drilling could act like a nicotine patch for smokers, an addiction expert says. In his 2006 State of the Union address, President Bush used the analogy while pushing for more research into alternative energy sources, saying, "here we have a serious problem. America is addicted to oil." 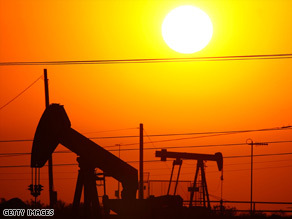 But is U.S. dependence on oil a true "addiction"? Jack Henningfield, an adjunct professor at Johns Hopkins University who has extensively studied addictions, said there are parallels. "Oil addiction is not an addiction in the medical sense, like a drug addiction or a tobacco addiction," Henningfield said. "But it is an addiction in the sense that powerful behaviors are involved. They're difficult to change, [and] it can be agonizing for people to change." Henningfield said that when it comes to substance addiction, the brain rewires itself to depend on the chemical. So, how does Bush's proposal for more oil drilling offshore and in the Arctic National Wildlife Refuge fit in to the science of addiction? Without commenting on the effectiveness of that proposal, Henningfield said the idea behind it can be compared to a smoker using a nicotine patch. "We have to give people ... some kind of aid to just function and just get along," Henningfield said. He added, however, that while studies show that aids such as the nicotine patch can help people function in the short term, as part of an effective long-term solution, additional drilling "may do little to actually help people in the short or long term to the oil addiction problem" and "could actually divert attention away from long-term solutions." Democrats argue that Bush's proposal would only enable America's oil addiction. House Speaker Nancy Pelosi, D-California, said recently, "Foreign oil, the president said we were addicted to it. And what does he want to do? He wants to reinforce the addiction." Pelosi has said she will not schedule votes in the House of Representatives to lift the bans on offshore drilling and oil exploration in ANWR. Henningfield said that's why any strategy to break an addiction must have a long-term goal. Ultimately, he said, kicking any habit can boil down to economics, as smoking studies have shown. "Money talks for addictions. Money gets people's attention. And the most important single driver to get people to quit smoking is the rising cost of cigarettes," Henningfield said. "So, with addictions -- whether it's cocaine, nicotine or oil -- money talks."